To someone who has spent his life living in both the United States and Greece, the idea that the United States is just a bad decision or two away from a Greek-style crisis is ridiculous. The differences between the two countries are too numerous to allow for a meaningful contrast. Yet since this is a serious concern, let us examine for a minute some of the relevant numbers. First of all, Greece has about twice as much state as the United States. Between 1995 and 2010, government spending in the United States averaged 31.6% of GDP versus 46.2% of GDP in Greece. Even if one excludes interest payments – higher in Greece – the share of government spending was 41.5% in Greece and 30% in the United States (from 2000 onwards). On the revenue side, the Greek government receives 39.5% of GDP versus the US government which receives just 29.3% of GDP. And these numbers capture only quantitative differences. Americans enjoy real services for this money, including a world-class military, versus Greeks who pump money into loss-making enterprises and offices who deliver sub-part services (if they deliver anything at all). For someone who has dealt with both Greek and American red tape and bureaucracy, the comparison is a stretch. Additionally, in Greece, state spending is much more intimately connected to basic notions of party and state legitimacy in ways that make it harder to tackle than in the United States (here). Lets us now look at debt. 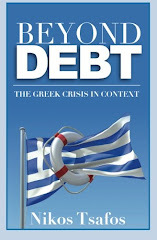 Public debt in the United States is expected to reach 69% of GDP in 2011 versus 156% in Greece (however, the US non-public sector is more heavily indebted than Greece's). But remember that in 2008, US debt was just 40% of GDP and that the rise in debt has been driven mostly by the cyclical effects of the 2008 economic crisis (plus fighting two wars). Of course, the concern is not with current debt, but with the forecasted growth in US debt. The benchmark forecast come from the Congressional Budget Office (CBO) which just released its latest estimates to 2035. The CBO presents two scenarios: a “current law” scenario (assuming no further legislative action) and a “current policy” scenario, where policymakers make probably changes to laws that preserve economic variables at historical or near-historical rates. Such Greek-style debt dynamic suggests that the United States would be its way to becoming a Greece. But the United States does not face a fiscal crisis as much as it faces a health-care crisis, where the underlying problem is health care (forget non-fiscal challenges for now). Government spending on health care is set to rise by 3.8 percentage points relative to GDP in the current law scenario and 4.8 points in the current policies scenario. By contrast, social security (pensions), rise by a more modest 1.3 percentage points in both scenarios. Other spending decreases in both scenarios. As a result, around 66% of non-interest (primary) government spending in 2035 comes from either health care or pensions versus 45% in 2011. This is America’s fiscal challenge. The United States thus faces a more clear-cut problem than Greece. Social tension in Greece comes from the need to cut pensions, raise taxes and shrink the public sector all in the midst of a recession. The US fiscal crisis, by contrast, will look different: at some point, the US government will need to cut medical spending or raise taxes (or both). This adjustment will be much simpler to accomplish. I say this because the United States can spend money in a much smarter way when it comes to health care. With no intention of getting into a debate on the matter, I base this statement on the following observations (I believe there is much support for this thesis). In 2009, the United States spent 17.4% of its GDP on health care, a full 45% more than second place Netherlands and almost twice as much (85%) than the average OECD country (here). What is more, this gap has been growing steadily, a trend accelerated since the early 1980s. Despite this spending, the United States performs poorly on several metrics: it has the fourth highest infant mortality rate in the OECD just behind Mexico, Turkey and Chile; life expectancy at birth puts it, 24th out of 32. In life expectancy at 65, it ranks 22nd in females (out of 31) and 17th in males. These metrics, however incomplete, suggest that the United States could do much better. Of course, I have no illusions about the ease with which health care reform can pass – the evidence shows how hard it is to introduce meaningful changes to the system. But I would like to close with three statements: first, America’s fiscal challenge is overwhelmingly a single-track challenge; second, the curtailment of health-care costs is the major adjustment that will restore fiscal sustainability; third, there is reason to believe that such an adjustment could come without compromising severely medical outcomes and hence creating a massive deterioration in living standards that would cause outright popular uprising. Such a challenge – which the country could tackle by several targeted and sensible reforms – seems much more manageable than the tasks facing the Greek government today.